Gourmet vegetarian chef, entrepreneur and author Natasha Corrett is the founder of the Honestly Healthy food company, which promotes the benefits of an alkaline diet and counts among its celebrity fans Victoria Beckham. The 32-year-old set up her company in 2010, delivering wholesome and healthy food free from wheat, gluten, cows' dairy and sugar to customers' homes. Natasha is the author of three books: Honestly healthy, Honestly healthy for life and Honestly healthy cleanse. She now travels the world teaching private chefs to cook the alkaline way and gives talks, demonstrations and cooking classes to those who share her passion for nutrition and alkalising. 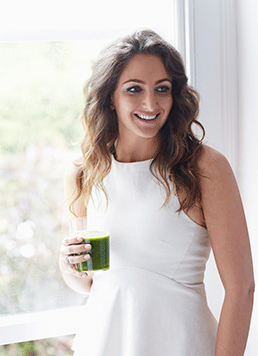 Q: What prompted you to first get into the alkalising diet? Natasha: I had hurt my back and went to see an Ayurvedic doctor for some acupuncture to help release it, and he suggested that I was very acidic from years of yo-yo dieting. He mentioned all the things I was feeling, like exhaustion, bloating, excess weight, bad skin and polycystic ovary syndrome (PCOS). I went on a 21-day cleanse and didn’t look back. After three months I got rid of my PCOS, my skin cleared up and I started losing weight slowly – and kept it off. The rest is history! Q: Would you say that it has transformed your health and your life in general? Natasha: Yes. I have honestly never felt better. I have so much more energy – I work hard and I don’t think I could do it if I didn’t eat well. Q: Can you explain the principles behind your diet? Natasha: Eating alkaline is about reducing the amount of acid-forming foods you consume to only 30 per cent of the time. These types of food include meat, dairy, sugar, coffee, alcohol, gluten and wheat. It’s about putting your body in the best state of balance that it can be, in order to work at its optimum level. Our bodies are naturally meant to be in an alkaline state as the pH level of our blood is meant to be between 7.35 and 7.45 which is slightly alkaline. When we eat acid-forming foods the body draws on the minerals and nutrients from our bones to help realkalise itself and this puts the body under unnecessary stress, depleting it of essential minerals. Q: What kind of foods do you eat on a daily basis? Natasha: I will normally start the day with a green smoothie containing some protein powder. I might have a roasted vegetable salad for lunch and then I’ll make a hearty meal for dinner for myself and my fiancé. And if I fancy something sweet then I will make some muffins. Q: Do you take any supplements or do you just rely on your diet to get all your nutrients? Natasha: I do take supplements as unfortunately our soil is so depleted of essential minerals that we just can’t get the quantities we need from our food. I take vitamins C, B, D and B12 as well as magnesium. Q: Where do you get your inspiration from for your dishes? Do you travel a lot and find that you are inspired by different foods and cultures? Natasha: Yes, exactly that. I find that travel massively inspires me and I love tasting different flavours and coming up with healthy alternatives. Natasha: I love exercising because it gives me energy. I do high-intensity interval training (HIIT), Pilates and I run once a week with my family, usually on a Sunday in the country. Q: Are you interested in natural and organic beauty? Natasha: Yes! I use REN products religiously. I love the glycolactic mask they have and also the omega oils. I use bareMinerals and Hourglass make-up which is cruelty-free as that’s very important to me. Q: Are you interested in complementary therapies? If so, which ones and how effective have you found them? Natasha: I used to have reiki and healing once a month. This has reminded me to call and book in! It keeps me very grounded. I also have reflexology every other week as it’s what keeps me balanced and really relaxes me. I love having my feet rubbed! Q: How do you relax and switch off from your busy life? Natasha: I take my dog Lottie for a walk and listen to music. At the moment I am listening to Jack Savoretti’s new album Written in Scars and also music by Jessie Ware who is a client of mine. Q: What projects do you have coming up in the near future? Natasha: We have a new ecommerce website coming up, where we will be launching a range of food products which I am really excited about. And I am writing my fourth book at the moment!